It seems that contemporary dance is at a crossroads. It is continuing to find itself while also attempting to define itself during a time when more people are mediating culture through screens (often times in private), thus adding to the visual world where more is being seen and less is being holistically experienced. This comes at a time when some dancers and dance companies in Edmonton are figuring out how to allow the camera in, to be part of their process. In a way they are trying to figure out how to ensure dance continues to move with the culture. Bringing the camera into dance is in part about the need to document but also the desire to create something less ephemeral, if only for funders and future generations. For dance artist Kathy Ochoa, it seems to me as someone who has watched her work for a while; the camera also provides an opportunity to engage the audience. For Ochoa the camera often serves as another presence ‘on stage’ as well as a cue or reminder to the audience to consider process. Process is important to Ochoa- in part one could argue it is Ochoa’s suggestion for how to make dance more accessible. By bringing the audience into the process, Ochoa’s seems to say, the audience gets a more connected idea of what is happening ‘on stage’ and off stage (thus finding value in dance). With this in mind it is no shock that her work has lead to considerations around collision. At the heart of the issue of filming dance is the inherent male gaze that comes with the camera. The symbolic nature of a protruding lens following (often) young women’s moving bodies is not lost on anyone. This is not to say that all cameras – be them film, digital or moving- are being held by perverts, it is more to say that the feminine energy that is so vital to being part of a dance is lost once the form becomes 2D, commodified, more easily objectified. Dance is a full experience- it is as much about the breath of the person beside you as it is about the breath of the dancers. The moment a dance becomes alive for any given person can be the way the light hits a dancer’s ankle or the way the score sounds coming of a the speakers. These are moments that might be caught on camera but never with the same back-story, intensity and organic arising as it does for a person truly in a space. Having a chance to witness, and in a way contribute to the process of Collision, I see how this project is a departure for Ochoa but also in a way- a response to the question of dance on film. There is an obvious fullness and femininity that is apparent in Collision. 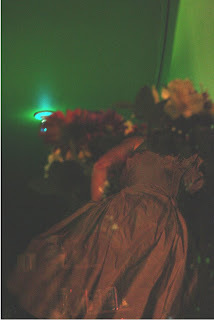 You can feel the softness in the flower references and the way the bodies move in seasons. It is in this softness, in relation to the title of the work, and the work itself, that the coming together of dance and film can be understood not to be of just two solid forms figuring out how to relate but the delicate colliding and meshing of elements and qualities to create something new. “It doesn’t have to make sense” is all she said to me and I believed it. *Originally published as part of Collison, a live human laboratory as presented by Azimuth Theatre and Expanse Dance Festival 2009. Art thrives in controversy; legends of artists are born this way. Think of Marcel Duchamp being derided in 1917 for submitting a signed urinal to a public art exhibition as Fountain, or the cries of disgust that greeted Manet’s Olympia at the Paris Salon of 1865. These moments in art are often moments of crisis, when our culture breaks out of its stasis to realise that something truly different is shaking it awake. Attila Richard Lukacs and Michael Morris are both familiar with controversy in their artistic practice. Both investigated queer themes throughout the 1970s and 80s and Lukacs did so using violent skinhead imagery during the decline of East Germany. Both artists have witnessed a strong cultural shift around queer culture in their lifetimes and can reasonably claim to have had a hand in that shift. It’s interesting, with this in mind, to look at Polaroids: Attila Richard Lukacs and Michael Morris, which just opened at the Art Gallery of Alberta. The exhibition is comprised of over 3000 individual Polaroids used as artistic studies for Lukacs large-scale historic paintings. Morris, a friend of Lukacs, becomes curator and collaborator, sorting and arranging a select number of the photos into panels of 12. The images are all of men, save for a mere 12 of a female model, and the models are predominantly Caucasian. The Polaroids function as documents – artifacts from an internationally recognized artist who has contributed work to the Canadian canon. Morris operates as an archivist and a monk, affectionately preserving Lukacs work, telling his story, building a temple to the icon. Looking at an individual panel of photographs through Attila’s fingerprints, I see photographs that were carefully staged and lit. Lukacs has a keen understanding of the Polaroid film – how the light works, how the paper fades, and uses this to create a thick chiaroscuro effect. Known for his art historical references, Lukacs poses his models after works by Goya, Michelangelo, Leonardo da Vinci and Carvaggio, to name a few. The clothes, when there are articles and the models are all very modern in their appearance, but Lukacs imbues the images with a painterly quality in composition, lighting and poses that cannot help but exude romance. The only indication that these images are from the last twenty years is the modern props included in the composition, such as wheelchairs, army boots, fatigues and syringes, and all the models have a fierce, militant look to them, with close-cropped hair, muscular bodies and a melancholy expression of obedience and submission. Zoom out, however, and your eyes dart fiercely around the room looking for something – anything to grab them and draw them in. There are 255 panels of the Polaroids, all arranged geometrically on the walls. There’s an occasional didactic panel, and five or six large scale paintings from Lukacs, but little else breaks up the space or draws the eye. It would almost be overwhelming, but it’s not a consistent effort and the distinct absence of any colour makes the exhibition feel just a little unfinished. The rich colour in each composition is not strong enough, to draw the viewer in, since each photograph is quite small. Lukacs uses a lighter palate in his paintings, so the larger works of art don’t have much presence in the space. As a shrine to Lukacs work, there needs to be a stronger presence of Lukacs professional history. The paintings chosen to accompany the photographs show neither the breadth of Lukacs career nor his talent. If I didn’t know Lukacs’ and Morris’ work from other sources, I wouldn’t really get a sense of why this exhibition was so important. Some of Lukacs’ work from, the 1980s or early 90s would help give context to his work, and provide a chronological grounding point to tell the story of his process. This would also permit a more active role from Morris, as he would have entry points within the gallery space to respond to the works and provide a more dynamic curatorial voice (apart from his brochure contribution). Morris is a transparent presence as curator and collaborator, though he explains his working process in the curatorial brochure. Within this shrine, he needs his prayers, he needs his rituals; he takes the viewer into the space, but is reluctant to share his passion, to tell his side of the story, instead hoping you are just as overwhelmed by Lukacs talent as he is, that you just bask in the radiance of each individual panel. This experience seems so far removed from the cautionary signs warning you about art as you approach the gallery. The gallery has programmed a large queer contingent from the local community to speak to the controversial nature of this exhibition. If you’re familiar with art in Edmonton over the last year, you might wonder if this is necessary, if the work merits the cautionary approach that it’s received. While the gallery is bringing in some interesting speakers on the topic of museums and controversy, I feel themes of the museum and the personal archive are just as important, though less sensational. The sense that there is a cultural shift happening in this exhibition, that this marks a new chapter in art history is simply not present. It is other wise, a glowing insight into the work of two major Canadian artists. The Hydeaway is a modest, independently run art gallery and performance venue located in downtown Edmonton. It offers a unique fusion of visual art and live music to an all-ages audience. It also truly lives up to its name. After circling the same high rises and parkades more times than I would like to publicly admit, I finally noticed that the Jekyll and Hyde Restaurant and Pub had a small sign posted in its window with the name of the venue on it. Little did I know, my stint of downtown confusion--albeit short--would turn out to be a good introduction to the exhibition I was traveling to see. Image credit: "Sprawl 5" Justin Shaw, 2009. 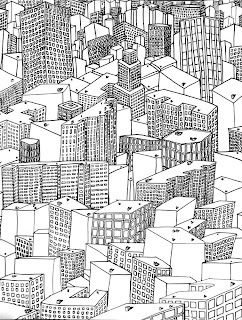 The exhibition, Sprawl, is a series of 6 pen and ink cityscapes by Edmonton artist and musician Justin Wayne Shaw curated by Institute Parachute. Shaw created this series after spending the past year exploring major urban centres such as Miami, New York, Montreal, and Toronto. Despite the pub atmosphere of the venue, Shaw's works are not typical “restaurant art” cityscapes featuring famous buildings that are kitschy and uninspiring. Instead, they effectively extend to viewers the experience Shaw had traveling through major cities, offering a sense of disorientation and spatial awe felt when exploring a large urban centre for the first time. This sense is achieved in a variety of ways throughout the series. The buildings that are only outlined are important to each drawing's aesthetic as well as conceptual success. The blank space offers the eye a place to rest while also adding to the first-time, big-city experience: the traveler is surrounded by unrecognizable buildings that eclipse one another as well as important information like street signs or landmarks. All of the drawings successfully distort perspective and scale and consequently the viewer's perception of space, but I find “Sprawl 5” and “Super Sprawl” achieve a sense of disorientation and awe most effectively. Both images feature no visible sky or ground, only a dense arrangement of buildings. A few of the buildings resemble real-life structures the artist would have seen such as the CN Tower, but they are not the focus of the work. Instead, they appear randomly in a dense sea of generic buildings and buildings that are merely an outline. While these two images contain many similarities, each piece evoked a strong sense of disorientation for me that stemmed from different factors. In “Sprawl 5” it was the play between the perspective of buildings that evoked this sense. The buildings in both images are depicted from above as if the viewer is on an airplane that is about to land, except for a few buildings at the top of “Sprawl 5” which were of particular significance. These buildings are seen from below which created tension as it pushed my eye back into the buildings seen from above, causing a greater sense of disorientation for me than the first four drawings did. “Super Sprawl” achieves a similar result of disorientation through its large size, format, and location. "Super Sprawl" measures 42x145 inches, making it more standard landscape format as opposed to the first five works that are twelve times smaller and achieve more height than width. This gave the image a much greater presence, affecting my peripheral vision and drawing me into the scene where I am confronted with buildings that don't make sense spatially. The drawing is situated across from a wall of windows that look out onto several Edmonton high-rises which added another dimension to the work, deepening my experience of awe and disorientation. “Super-Sprawl” also occupies its own wall, which meant I didn't have to lean over occupied booths to experience the full impact of the work as I had to for the others. Shaw's cityscapes, most notably “Sprawl 5” and “Super Sprawl,” excited me because through them I was able to explore what the artist explored during the past year in a way that focused on emotional experience as opposed to just noting famous attractions. As spring arrives and you begin to feel the urge to travel, consider making your first trip an adventure through Shaw's cityscapes at The Hydeaway--only make sure you know where the venue is before you leave the house. Last week, Austrian auteur Michael Haneke’s trilogy on violence played at Metro Cinema, followed by a panel discussion on the ethics and politics of violence. The first scene in Benny’s Video, the second film in the installment, is a home video of a squealing pig being air punctured at the top of its skull, captured in close up as it writhes amongst the commotion of farm hands. The scene is then paused, rewound and played again in slow motion. There is no doubt that we are watching the death of a live animal, watching the moment of its death through a mediated sense of control that still denies us (and the character in the film) from actually experiencing the effect of the moment. Beautiful, as an adjective, means absolutely nothing in this context—especially when applied to a visual object. Neither scene for me is very “beautiful,” but I am affected in the sense that my thoughts, my blood, have been stirred. Beautiful, as an emotion, is an arrested sensation we often conflate with something we encounter in the world. The problem here for me is not the death of the animals, but the representations of their deaths and our relation to the event. In both scenes, there is undeniably a sense of control on screen and off. We as viewers are positioned as privileged, but the reindeer scene, which is supposed to counter Haneke’s coldness, is in fact far more disturbing, as the man with the knife looks knowingly into the camera as he performs. We are no longer just voyeurs into a spectacle, but we are made implicit through his recognition of us, and our fullest attention to his action. What is beautiful then is an archaic sense of desire, or in other words, unrequited pleasure. All of this also reminds me of the moral outrage sparked last summer by Mexican artist Guillermo Vargas, aka Habacuc, who found a malnourished street dog and tied it up in a gallery setting as a means to force viewers to bare witness to its starvation. A great amount of offense was taken at the supposed cruelty of letting an animal die (as art), and the opposing arguments praise Habacuc for magnifying the lack of social empathy by forcing viewers to confront the inevitable demise of a living creature bred from the social conditions we all silently tolerate. There is nothing aesthetically beautiful about watching a street dog dying, but there is an ethically charged call to arms that does not exist within a simple metaphor. I remember talking to UK performance artist Kira O’Reilly about the Habacuc exhibit, which had just caught international attention when she was in town last summer, and I was surprised that her response was quite negative. Reilly’s “inthewrongplaceness” received the scorn of animal rights activists when visitors were invited one at a time to witness the artist lie naked in bed caressing and engaging with the corpse of a dead pig. For her, she felt Habacuc’s choice to let the animal die instead of at least trying to save it was problematic. But long after that particular case, and the hundreds if not thousands more, I wonder why the onus was up to any single person such as the artist—rather than directed towards any member of the attending public—to live up to his or her experience and do something, anything, besides stand by and watch. Spending the greater portion of this past weekend at the Expanse Movement Arts Festival, I was among a few scores of audience members watching everything from emerging dancers and choreographers to international-calibre dance artists and choreography. Personally, I find dance in its contemporary form as the most conducive experience that exists purely in the affect between thinking bodies, be it dancer to dancer or dancer to audience or even audience to audience. It is a live art form that exchanges and communicates immediately—or doesn’t—on a plane that is far more reactive than engaging with object-based works. When a piece resonates, that experience can lead to immediate new lines of thought and action for audience and performers alike. When a piece doesn’t work, it’s hard to tell if it’s just you, as unlike visual media, there is a shared audience that politely claps no matter what the outcome. Only finally, after years of scratching my head at the uniform reception, someone finally noted the general atmosphere was one of apathy. Not in the least surprising, but also alarmingly accurate, this sentiment did not come from an audience member, but from a performer describing the Edmonton audience. From dance to music to literary to visual arts, apathy or any lack of emotive interest is definitely noted from the sea of crossed arms and stiff upper lips. Some people genuinely enjoy themselves and appreciate the arts, of course, but more often than not they show their agreeability through presence alone. Rarely the diplomat, I often publicly remark about how much I dislike art. The sentiment is not accrued from encountering any specific works, but is mostly just a general disposition from an apathetic environment. It may not be the art—in whatever form—that is irritating, but the reactions and (lack of) communication it receives and illicits. Art, in any formation, doesn’t exist in a bubble. It always exists on a multifaceted plane and can be so much more than just selfish construction and consumption. Apathy is the worst response one could wish for, as it’s a sign that, overall, the work hasn’t moved or challenged anything or anyone, for better or for worse. In the almost seven years since I’ve been a freelance arts writer in this city, shifts have been noted in the development of dialogue within the arts communities, but not so much with its outreach to new audiences. I have no recollection of when or why I started avidly attending visual art exhibitions specifically, as scoping out visual art in Edmonton was never a priority or even a particularly memorable experience, at least not until I started striking up conversations with increasingly familiar faces. Some of those faces would become friends and associates, and it was a particular interest in the people that led me to wonder why there was not more rigorous support for what each were trying to accomplish. Many state the community here is just too small and nobody wants to step on anybody else’s toes with criticism, but that attitude is more a hindrance to growth to both the relationship as people as it is a block to the relationship to their art. It is out of respect that one should vocalize their opinion, as anything short of that basic human dialogue is a death to expression. Sylvain Voyer's artistic roots run deep within the community of Alberta. Born in Edmonton in 1939, he has been making paintings for over 50 years. From his developmental years as a student at the Alberta College of Art in Calgary; to his activist ambitions behind co-founding the artists run centre Latitude 53 with Harry Savage in 1972; to his current role as a much celebrated and successful artist who has attained a mature style; Voyer has consistently been an integral part of Alberta's artistic identity and development. 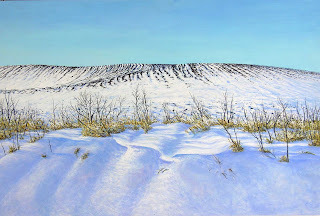 Image credit: Sylvain Voyer, "Snow Drifts" 1985, 122 x 81 cm, acrylic on masonite. Image courtesy of the AGA. The Art Gallery of Alberta's retrospective exhibition lays out Voyer's life work in reverse chronological order, so that upon entering, you are first exposed to the well known Canola Field paintings. These works are bright, and very approachable. There is also nothing really challenging about them. Landscape painting is thematically friendly, and I think the AGA knows this, and took full advantage. Which is smart; getting people into the gallery is an important ambition. The strength of the show itself though would have benefited from some editing. Voyer has a keen eye when it comes to composition, and he knows how to make really attractive pictures. But there is a lot of work in those first few rooms that is pleasant to look at--and easy to forget. There are larger dramatic paintings, like "Nice Day in July", and "Ada Boulevard", which are much more experimental, and stand out because of their visual intensity. These paintings seem to be about the boundaries and abilities of paint, as much as they are about depicting fields and skies and trees. This is where Voyer's work remains exciting; when he incorporates the ideas and formal experimentation of his earlier work into the realm of his contemporary representation. He breaks down the picture, keeping enough information to not lose the connection completely. 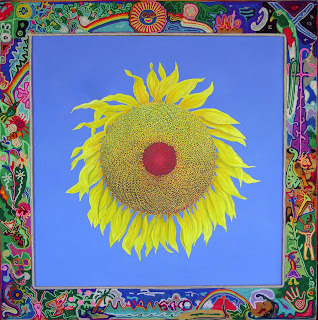 Image credit: Sylvain Voyer, "Solflower" 1990, 136 x 136 cm, acrylic on canvas. Image courtesy of the AGA. As you move back through the gallery, paintings remain organized by theme. There is the Winter room, the Tree room, the Edmonton room. Two side galleries hold work done in the 80's when Voyer and his wife began wintering in Mexico. These paintings have strong cultural themes, showing scenes from Mexican villages, incorporating materials and imagery from the surrounding culture. They range between being incredibly endearing to overly ambitious. The smaller paintings feel like studies of local Mexican life and are intimately rendered. They have the same quality of invested time and consideration that Voyer's smaller paintings of local Edmonton landmarks and scenery have. The larger works however, become all about material. He is clearly experimenting, but the massive and elaborate frames feel more obnoxious than cohesive. I understand the intent behind them, but put in comparison with the other work, they are too much. Then there is the early work from the 60's and 70's. This is when Edmonton's love affair with Flatness begins, and the rest of the art world moved on. Voyer's work from this time shows an incredible awareness of this. There is work that clearly resembles Op-Art; pieces from the "New York, hard - edge" series that concentrate on creating illusionistic and 3D effects with stripes and colour. There is work concerned with ideas about ownership and appropriation. In the "Recycled Art" series Voyer paints on top of pre-existing images, turning the mediocre into inventive and humorous pictures. There are the sculptural and assemblage works, where material is used satirically and perhaps with reverence to the past. "The Guggenheim" from 1979 shows a hanging paint can, covered with a scroll of paper that has images of historic paintings plastered over its curves. "Museum of Modern Art", from the same year, is an arrangement of clear cubes that have these similar art history postcards applied to them. These clear boxes are all contained together under their own plexi-cube. And then there's collage work, where Voyer dices up images and re-assembles them into massive historical mazes. In this one room at the back of the gallery, there exists endless ideas and jokes and un-inhibited visual experiments. This is the work done by Sylvain Voyer that fascinates and delights me. It is an amazing thing to walk through this show and witness the evolution taken by this one artist, and the range that he has worked to develop. To see where he came from, and how he arrived at the style of painting he is so well known for today. His current paintings may not be my favourite of the exhibition, but that is pretty insignificant. This show is about an artist who has given much of himself to his artistic practice and to his home; one has to respect and admire that journey. Bears, elk, deer and wolves pace wistfully outside of an outdoor hockey game. A hockey player falls through the ice while the remaining players play on indifferently. An ice floe resembles a sublime arctic night ferry. A fisherman floats face downward upon a family fishing scene. A group of beavers have chewed down a totem pole, caught in the act, while a monkey is carried off, unconcerned, by an eagle. An igloo has been set ablaze, looked on by figures frozen in kitschy gift-shop poses of the surprised doll, the howling wolf, and the helpful Mountie. Prints of Group of Seven paintings are backdrops for these scenes in Diana Thorneycroft’s latest series of photographs at Skew in an exhibition titled A Group of Seven Awkward Moments. Image credit: Diana Thorneycroft "Group Of Seven Awkward Moments (Algonquin Park)", 2007. Courtesy of Skew Gallery. 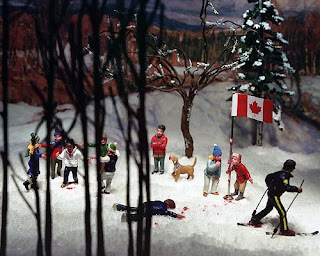 Continuing the use of figurines and miniature set pieces based upon well known Canadiana via the souvenir and collectible, Thorneycroft focuses upon the deadpan and the slapstick within scenes of thwarted schmaltz. Aside from the tarnished dignity of these recognizable Canadian figures, what works in these photographs is the overall way that these manufactured actors ‘play it straight’ within scenes of often harrowing situations. This speaks to the widely-accepted, phony veneer and formulaic ‘realism’ within the depiction of violence in the TV drama and cinematic blockbuster. The most successful photographs in Thorneycroft’s series pushes this awareness of overacting into corners or allows for dark and risky humor. The photograph '(Mirror Lake)' skips the full frontal iconic for the spotlit eeriness of the diorama’s frozen emptiness, wherein two approaching bears are out of focus and creepily 'snapshot', while two fishermen reel in the night’s catch with an unawareness resembling a scene from ‘Jaws’. ‘(Algonquin Park)’ finds the right balance of awkward indifference, earnest overacting, and slapstick horror within a well-lit winter woodland scene. Several children in parkas and toques react to the well-known, not necessarily Canadian myth of the danger of licking a frozen metal post. One child bends over in hokey awe as another child attempts the forbidden initiation, despite the fact that several oversize, truncated tongues hang fixed to the outer side of the post. A trail of blood leads to the suggestion of a failed (or ‘successful’) attempt, while a crowd of children have created a circle around a dazed but delighted child, sans tongue. An RCMP officer skis by with jaunty self-absorption, while another child watches with arms crossed, practically rolling his eyes.